A jammed finger is a frustrating sports injury. It can happen in just about any sport, and while seemingly simple, can really put a damper on your ability to play. Learn more about finger sprains, how they happen, and what to do about them below. 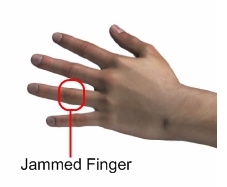 A jammed finger, in medical terms, is a sprain of the joint capsule of the inter-phalangeal joints. What? In English? It is injury to the knuckles. It has probably happended to you before. You were reaching out to catch the basketball, and it moved funny, or you weren't quite ready, and it caught you right on the end of your finger. It hurts like crazy, and kinda stuns you for a minute. That is how you jam your finger. The force that hits the end of the finger is translated through the bones into the joint. Often, the ends of the phalanges (finger bones) are bruised at the knuckle, and this is what causes the swelling, as well as damage to the capsule. There are other ways to suffer a finger sprain. You can get it bent the wrong way, or too far another way. You can get it stepped on, smashed between two helmets, hit with a baseball, or any other numerous ways that produce enough force to cause injury. 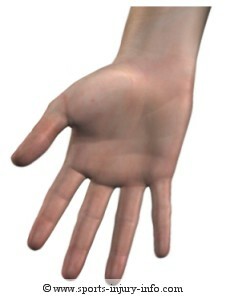 Fingers are in the middle of most sports, and they tend to get hurt. Pain, swelling, loss of motion, and loss of strength are all very common symptoms of a jammed finger. Swelling within the joint is very obvious, and you can usually tell very easily when you have suffered a finger sprain. One knuckle will swell up, and it will look noticibly bigger than the others. Unfortunately, this swelling often lasts for weeks if not months. Sometimes it never completely goes away. Pain and motion usually come back fairly quickly, depending on how severe the sprain is. Treating pain and swelling are the first steps of treating a jammed finger. As soon after injury as you can, use the R.I.C.E. 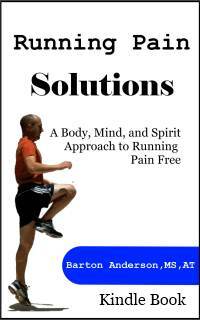 Principles to help reduce your pain and discomfort. Depending on how much pain, swelling, and loss of motion you have, you may need to see your physician. This is especially true if you took a pretty hard hit to the finger, or if it was bent backwards violently. You may have suffered a finger fracture and not just a sprain. It is sometimes hard to differentiate between the two, so an X-ray may be a good idea to be safe. Once a fracture is ruled out, you can begin working on improving your range of motion and strength. Use ice and rest for a few days, and then begin trying to bend and straighten the finger. Do this gently, only pushing into mild discomfort. Gradually, your motion will return, as swelling goes down. Some finger sprains may need to be splinted. If you have significant swelling and pain, see your physician, and they will direct you with treatment. Jammed fingers are very common in sports, and they are ofen overlooked as insignificant. This is sometimes true, but a little rest and ice can go a long way to reduce the time it takes to heal, and to get things back to normal. Don't assume that you just sprained your finger. If you have lots of swelling and pain, see your physician for an X-ray. Fingers, although overlooked, are extremely important to your sports participation, and in the rest of life. Do yourself a favor and take care of them.